In his novels Spook Country and Zero History, Bruce Sterling popularized the idea of locative art—digital art tied to specific locations—using GPS and internet-connected devices. He imagines a viewer of locative art holding up a smartphone and seeing on its screen what is in front of him or her, with an overlay of artwork such as rows of crosses, flying squid, or an actor depicting Scott Fitzgerald. 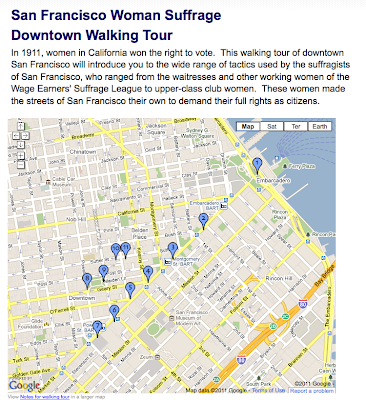 I also make use of possibilities opened up by mobile smart technology in my San Francisco walking tour, which explores how turn-of-the-century women made use of San Francisco’s downtown in their fight for the vote. I don’t have the programming ability to overlay virtual reality in the mode of Sterling’s imagined locative artists. However, clicking any link on the tour map presents users with not just words that allow them to understand what this place was historically, but also images of what each place looked like that they can imaginatively layer over what they see in front of them. A few even include sound links, so that as a user stands at Newspaper Corners (Kearny, Geary, and Market Streets), he or she can hear Luisa Tetrazzini singing “The Last Rose of Summer” just as she did at that location on Christmas Eve in 1910 to celebrate the rebirth of San Francisco after the devastating earthquake and fire of 1906. I am very excited about the ways that mobile internet-enabled technology and locative media can help make history alive. All places are deeply layered with history. Some of that history is embedded in the built environment, something I found revelatory when I learned about American vernacular architecture and cultural landscapes and began to understand how to read the built environment to see when a place was settled, by whom, and for what purposes. In my book, Women and the Everyday City, I explore how those ordinary buildings and landscapes are also embedded with the history of gender ideology and women’s experiences. My walking tour unpacks some of that history by informing its users how women at the turn of the century used San Francisco’s downtown and how they reinvented its everyday spaces as political space in their successful fight to gain the vote 100 years ago. Guided walking tours provide a wonderful way to unpack some of the history embedded in a place. Our memories of memoirs, novels, and history books also enliven our understanding of the history of a place. Locative media like my online tour can add more layers to our experience of place, giving us a place-specific window into the past. With history in our pockets, we can connect the present and the past through our experience of place. Jessica Ellen Sewell is author of Women and the Everyday City: Public Space in San Francisco, 1890-1915. She will be reading from her book this Thursday, Feb. 10th, at 7PM at Bluestockings in NY.